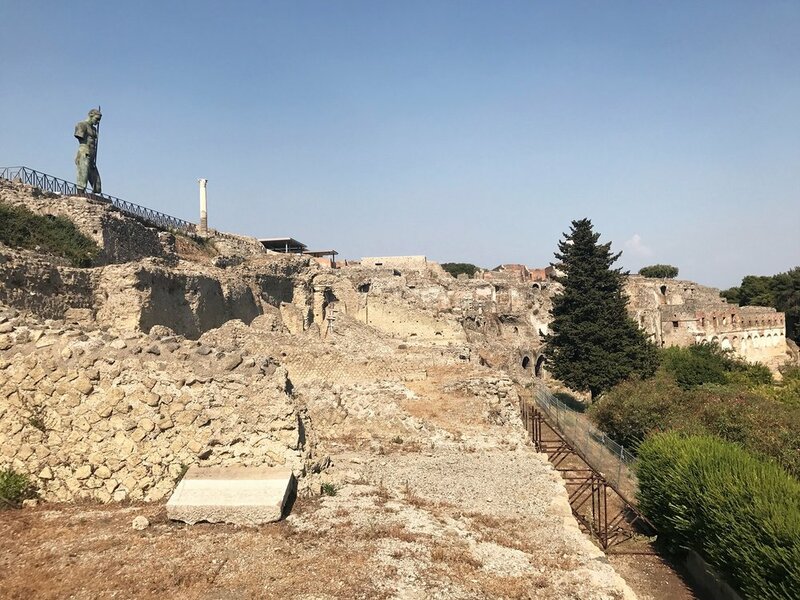 A Look into the World’s Most Famous Volcano & The City It Destroyed — Sapphire & Elm Travel Co.
Just after 1pm in southern Italy, the sky turned black and rained stone, ash, and volcanic gases covering the city of Pompeii. In 79AD, after a century long slumber, the volcano awoke with terrifying power. A firestorm of poisonous vapors and molten debris engulfed the surrounding area, suffocating inhabitants. The eruption lasted for two days, until nothing remained to be seen of the once thriving community. Most of the city's 20,000 residents fled as roofs and floors began collapsing under the weight of falling rocks and ash spewing from the volcano. Thousands of people would die in the events of 79AD, their bodies sealed beneath layers of pumice until recently. Today, parts of Pompeii bas been excavated and are among the most remarkable archaeological sites of the world, allowing us to have an excellent view on Roman life and culture, where time and life had been frozen in a moment. Vesuvius ("Vesuvio" in Italian) is probably the most famous and most dangerous volcano on Earth. For these reasons, the story of Pompeii and Mount Vesuvius has always been one that intrigued me. It’s a remarkable story that happened to such an ordinary village. 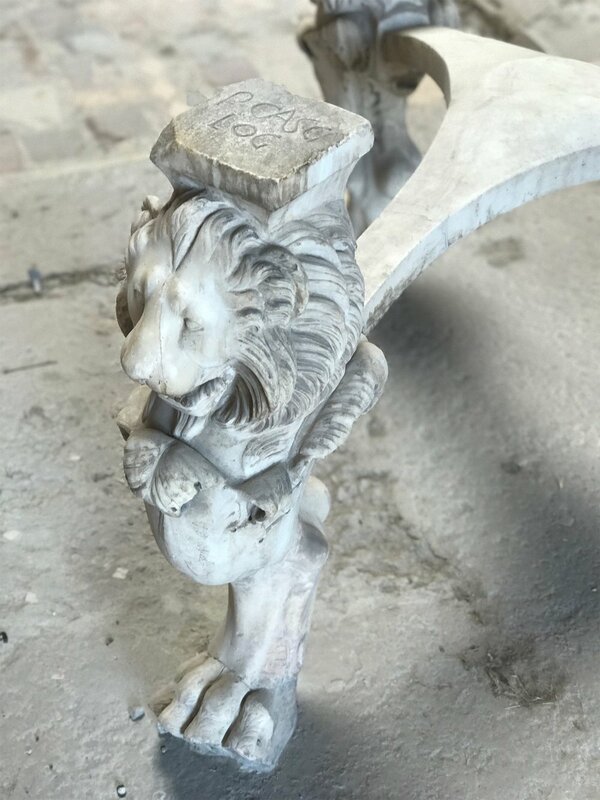 When I had an opportunity to go to Italy again in the summer of 2017, I wanted to go to a city I hadn’t been to before so we have personal experience in more Italian cities for our clients. This ruled out Rome, Venice, Florence, and Milan. I landed on Naples since I’ve heard so much about it (talking about pizza), and it was near to a few other destinations I was dying to see for myself; Pompeii, Mount Vesuvius and the Almafi Coast. The famous eruption of 79AD demonstrates that Mount Vesuvius and Pompei are near to each other, but in fact they’re only 10 miles (15 km) apart. 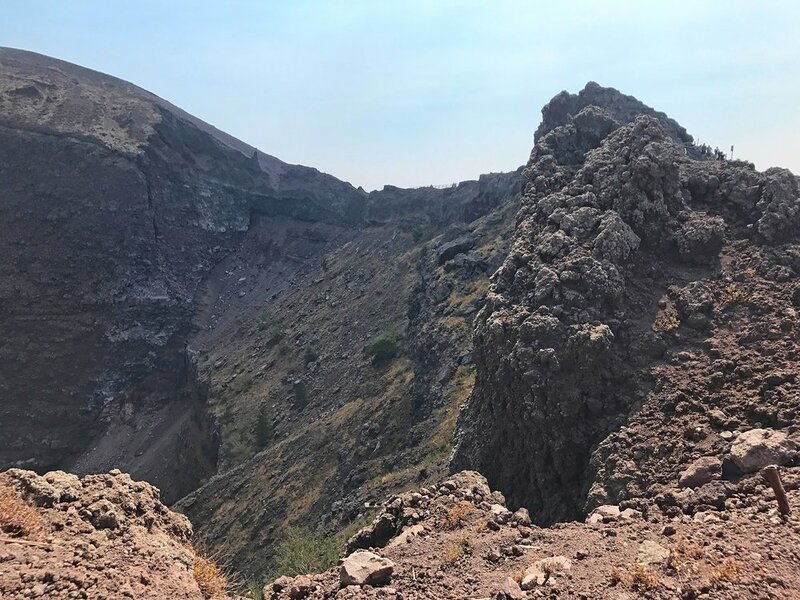 Vesuvius is now a national park and a UNESCO Biosphere Reserve, making it a lovely hike and way to stay active while on vacation, particularly in early summer after rain so the mountain is decorated in many beautiful colors and before the crowds of summer. You are driven to a spot towards the top of the volcano and dropped off, with a rendezvous of 1.5 hours. It takes roughly 35-40 minutes to walk up to the top, and 20-25 minutes to walk down. In the summer of 2017, it cost 20€ (8-10€ for the bus and 10€ for the entrance). Hiking up the volcano provides you with views of surrounding cities, mountains and the Mediterranean Sea. As you climb up, the terrain is very apparent, but rocky and unpaved so not exactly suitable for wheelchairs and strollers. Once you reach the summit of the volcano, you are transported to another world entirely – black volcanic rock line the rim and only the toughest of life is still present in this barren land. After I returned back to the train station at Ercolano, I continued onto Pompeii station for Pompei. NEED TO KNOW: The difference between Pompeii and Pompei is that Pompei is the city, and Pompeii is the archaeological site. Pompei is a fascinating city. Walking through it you feel as if you are walking through a piece of history. Streets and sidewalks are paved, pipelines and sewage systems are clearly identifiable. At that time, it was very rare for civilizations to have a sewage system, so even though the sewage ran into the street and there were stones to cross cleanly, it is a very impressive marvel. 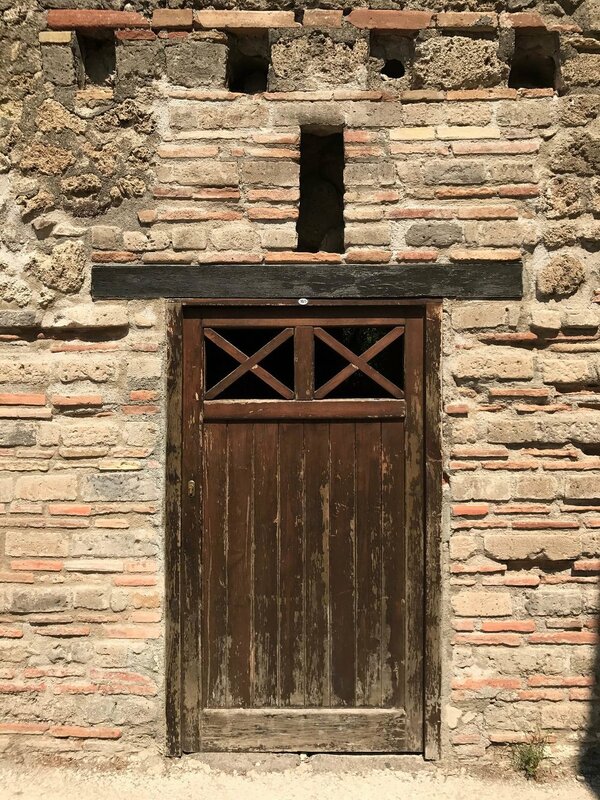 Wood doors trapped the bodies of 18 gladiators in their rooms – they were prisoners after all. Golden Lady of Pompei was found outside of the room of one gladiator, this love story is featured in several movies such as Pompeii, staring Kit Harrington for you Game of Thrones lovers. In Casa di Casca Longus, this well preserved room is an example of how people once lived here 2,000 years ago. You can still see furniture they once used and colored art painted onto the walls. 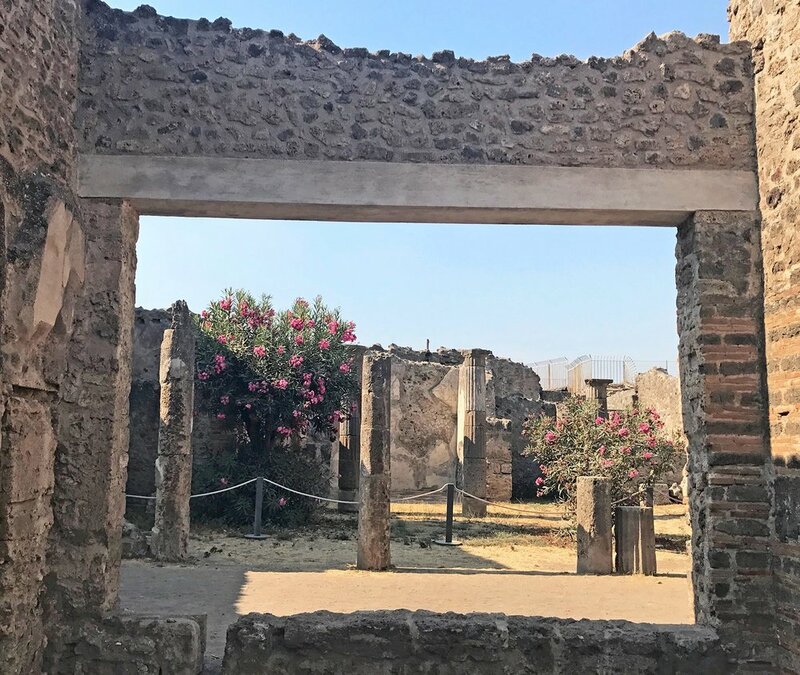 Walking through the civilization, you can even see how fast food restaurants used to be in ancient Pompei – yes, they had walk up and takeaway establishments selling food! 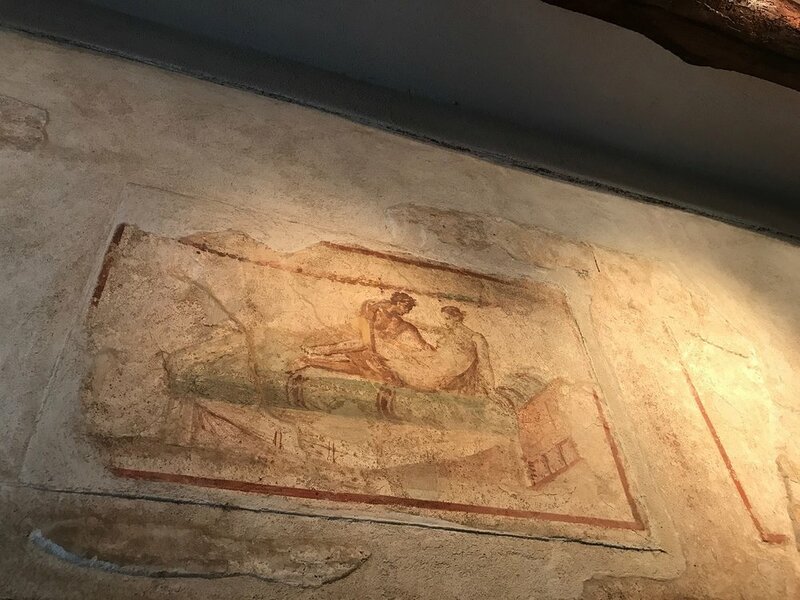 Additionally, you visit ancient brothels where pictures on the walls depict positions customers could choose from, and bath houses where bathing was public and free. Perhaps the most alarming part of Pompei is being able to clearly see the people who were killed; women, children, even dogs that were frozen in time in the ash that rained on Pompei and destroyed the city. Tickets to visit Pompei cost 13€. Option for a guided tour or audio tour are extra. Exploring Pompei and discovering what life was like thousands of years ago is so much better than reading any history book or watching any documentary. We highly recommend this experience for all history lovers! I visited in August when many Italians and other Europeans have the month off, so both sites and transportation to the sites were very crowded. You can see both sites in one day, although if you have time I recommend splitting them up as Pompeii is quite large and by the end of the day you will be exhausted! If you decide to see both in the same day, you have two options; climb Mount Vesuvius first then continue on to Pompeii, or start at Pompeii and climb Vesuvius afterwards. I did the first option. There are several pros and cons to both, contact us to see which option is right for you. Mount Vesuvius is a somma-stratovolcano located about 5.6 miles (9 km) east of Naples, Italy and a short distance from the shore providing stunning, sweeping views of the ocean. Mount Vesuvius, or more correctly the Somma-Vesuvius complex, is about 400,000 years old. The volcano is classed as a complex stratovolcano because its eruptions typically involve explosive eruptions as well as pyroclastic flows. Although currently in a dormant phase, Vesuvius is an extremely active volcano and particular for its unusually varied style of activity: it ranges from Hawaiian-style emission of very liquid lava, extreme lava fountains, lava lakes and lava flows, over Strombolian and Vulcanian eruptions to violently explosive Plinian eruptions – named after Pliny for his written accounts of the eruption – that produce large pyroclastic flows. Steaming vents are a reminder that while Vesuvius is quiet today, it's just taking a geological nap. The last eruption was in 1944, and it's only a matter of when, not if, it will erupt again. But don’t worry, Italian authorities close Vesuvius to visitors when they think the volcano is acting too frisky. FUN FACT: Vesuvius has erupted roughly 40 times since the famous eruption of 79AD, and is the only volcano on the European mainland to have erupted within the last hundred years. Today, it is regarded as one of the most dangerous volcanoes in the world because of the population of 3,000,000 people living nearby and its tendency towards violent, explosive eruptions making it the most densely populated volcanic region in the world. The city of Pompeii dates back to 7th century BCE, and was originally built on the on the sea. Before the eruption of 79AD, Mount Vesuvius was a very different mountain, possibly as high as 6,600 feet (2,000 meters) and was thickly vegetated; few people suspected they were living close to a major geological hazard. Current height? The eruption ejected a cloud of stones, ashes and volcanic gases to a height of 21 miles (33 km), spewing molten rock and pulverized pumice, ultimately releasing a hundred thousand times the thermal energy released by the Hiroshima-Nagasaki bombings. The only surviving eyewitness account of the event consists of two letters by Pliny the Younger to the historian Tacitus. His uncle Pliny the Elder died in AD 79, while attempting the rescue a friend and his family from the eruption of Mount Vesuvius. Between 5-50 meters of ash buried the city. Humans can’t survive for 2 hours breathing in ash before the person suffocates. The ash gets stronger and becomes a rock-like substance, surrounding the body. The body decomposes inside the ash substance until it disintegrates. Archaeologists during excavations filled these empty ash-rock substances, and what they were left with is a horrific view of many people and animals who perished in the eruption. More than 1,000 people died in the eruption, but exact numbers are unknown. I arrived in Naples on the train from Rome and checked into my hotel. Then, first things first, find pizza. I stumbled upon a collection of narrow winding streets, with people filling the streets to eat, drink, talk and shop. I choose a pizzeria that’s full (a good sign) and observe the whole pizza in front of each customer. I’m sold. FUN FACT: In December 2017, just a few months after my trip to Italy, Naples received UNESCO World Heritage status for their pizza! I order and my pizza is placed in front of me. It’s huge, cheesy, with a thick but crusty base (my favorite). Although I sink into every lustful bite of bread, marinara sauce, cheese and toppings, I struggle to eat half of this massive pizza. I look around and I’m the only one who hasn’t wiped my plate clean. My first day completely free, I set out for Vesuvius and Pompeii. Around 8:30 am, the line to buy train tickets at the Naples station was absolutely packed! By 9am, the platform was full of people people standing shoulder to shoulder, and the train is even more cramped. I reminded myself that it’s a Friday in August, so I shouldn’t be surprised or agitated – mindset is everything, right? TRAVELER’S TIP: Leave Naples early for Pompeii and Vesuvius. Be at the train station by 7:30 or 8am in the late summer months, you’ll have more leeway in non-peak months. Naples can be used as a base city not only for Mount Vesuvius and Pompeii, but also for Amalfi, Capri, Sorrento, Positano and many more wonderful places. Contact us to begin planning your one-of-a-kind adventure to Italy.